Some homes were designed with high ceilings. This can make the room look bigger and you will get the airy feeling of grandeur. 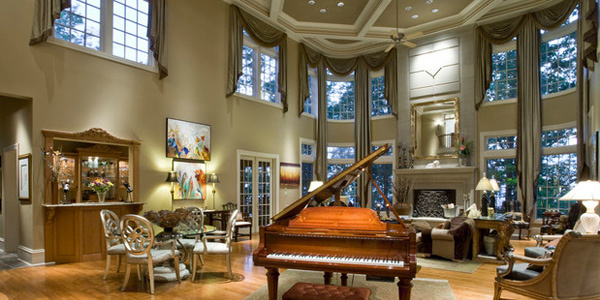 If a house has high ceilings, it also has taller windows allowing more light to enter the room. It can also draw the eyes more to the beauty of the space. 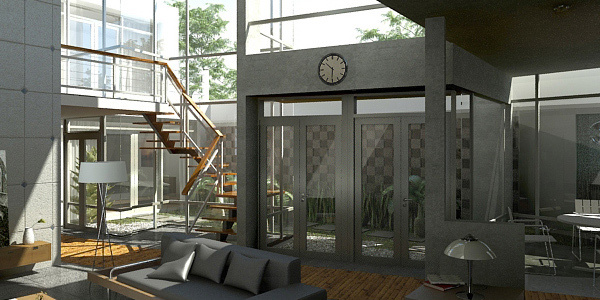 A house with high ceilings can also look good with a mezzanine. 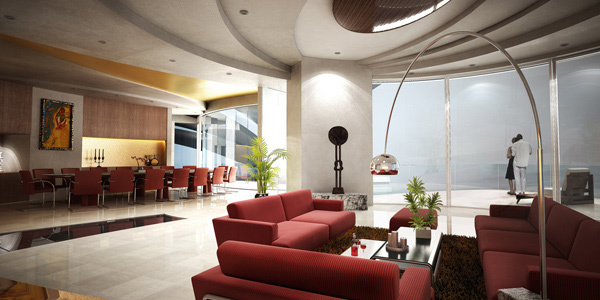 But the thing about high ceiling interiors is that it is more challenging to decorate it. Are you familiar with the rule of thirds? This can greatly help you in decorating your home’s interior. Visually divide your interior into three parts. This leaves you with the upper part near the ceiling, the middle part and the bottom part near the floor. The upper part should be left as is. 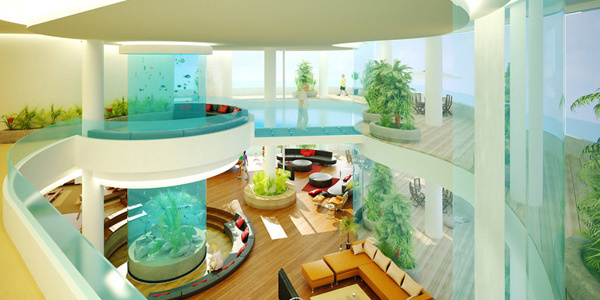 The middle part can have some wall paintings on it while the lower part contains the furniture and other decor. Doing this will help you diminish the look of your room with high ceilings. 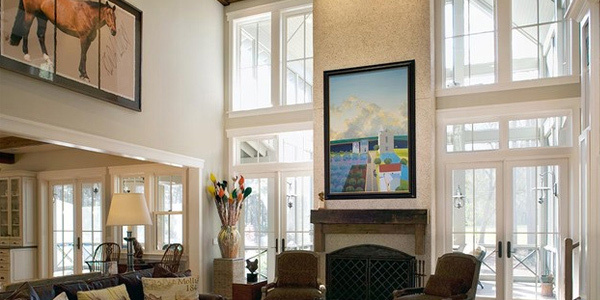 With high ceilings, you have a wider wall to paint. You can try using bold colors for the walls but of course light colors always work well and can even make your room look even larger. But do not be afraid to play with dark colors too if not for the walls, you can use dark colors for the furniture or accessories. Wall decorations include wall paintings, graphic arts and others which you can place on your walls. Placing these decors can add life to your room. You can place it at eye level but you can also try placing a big wall painting. Arrange your wall decors the way you want it. To add elegance and drama to your living room, place some lighting. 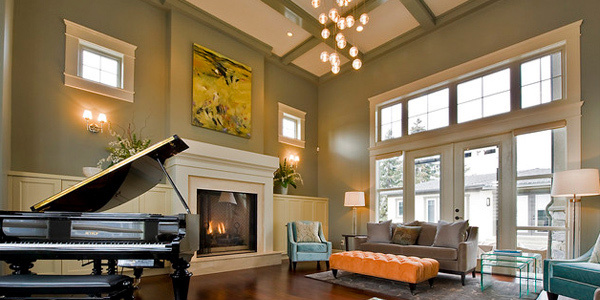 A chandelier or a pendant light can work well for rooms with high ceilings. You can also add accent lights and even wall sconces. Spot lights can also be used to highlight your wall paintings. 5. Use curtains for windows. Since you will be having many windows, use curtains to decorate them. You can try placing long curtains that covers the entire window but make sure that this can be closed and opened. You can also try adding valances only just to make the windows look lovely. Be sure to choose the colors of your curtains too. Plain ones are better than printed fabrics. Aside from the walls, you should also work on your ceiling. Add some texture to your ceiling or you can have a decorative ceiling too. Some would even place murals on the ceilings which are also a good idea. Another good way to decorate your home is to add accent walls. Choose a certain side of the wall where you can create an accent wall. Accent walls can add a great look to your interior which will draw the eyes of the guests. With an accent wall, your room will never look boring. There are many interiors these days that leave their beams exposed. It actually looks good and could add appeal to a room with high ceilings. Exposed beams can make a room look more friendly and cozy. Some designers even add some beams just to tone down the look of an interior. 9. Try repeating colors and decor. If you try repeating the same color all throughout the room, this will make it look cozier. Like, you can add some touches of black in your decors. This can also create a coherent look for your room. You can also try repeating objects like a row of flower decors and others. When we say cluttered decor, this means that the decoration is not well arranged. Avoid placing so many small items in your room. Instead, use less large ones or medium sized decors. You can keep a room simple by placing fewer items that are not too small and not too big. A room can still look cluttered even through the decorations you place in it. So, you have to be careful. 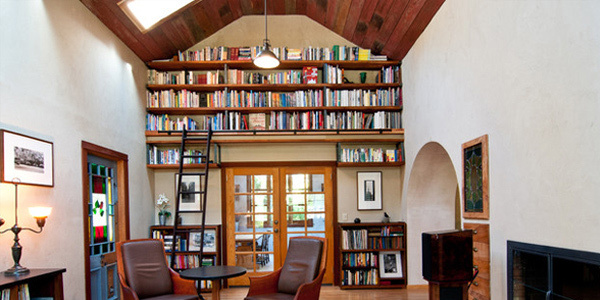 When done rightly, a house with high ceilings can look good. You can apply the tips we have given above. You can also try looking at some interior designs with high ceilings so you can get ideas and inspirations on what you can do with your own home. Like what we have mentioned, you can also have a mezzanine in your home. We also have some tips on how to design a mezzanine.